Like many people — including Buzzfeed’s Craig Silverman, who helped popularize the phrase — I’ve developed a strong dislike for the term “fake news.” Its use as umbrella term has rendered it meaningless, or malign. Some use it to describe information that really is false and created to intentionally mislead. Others use the same term to try to discredit information that is true but unwelcome. Whatever their reason or own definition, 19 percent of U.S. adults associate the word “news” with the word “fake.” And though we don’t know if they really believe it to be true, the prevalence of the association means that though we may not like the phrase “fake news,” we can’t ignore it. 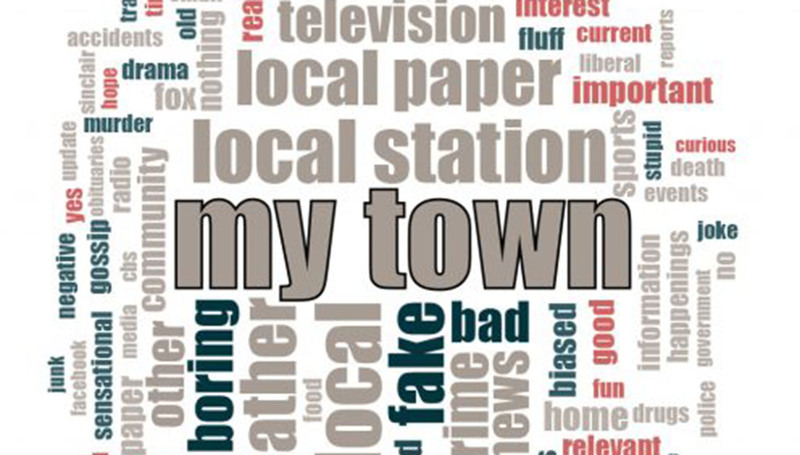 When you compare the results as word clouds, the visuals are striking: a big “fake” in the middle of the general news word cloud juxtaposed against a similar-sized “my town” (the category we created to encompass results related to people’s hometowns) for local news. With just a glance, they tell a story of contrasting reputations and sentiment. 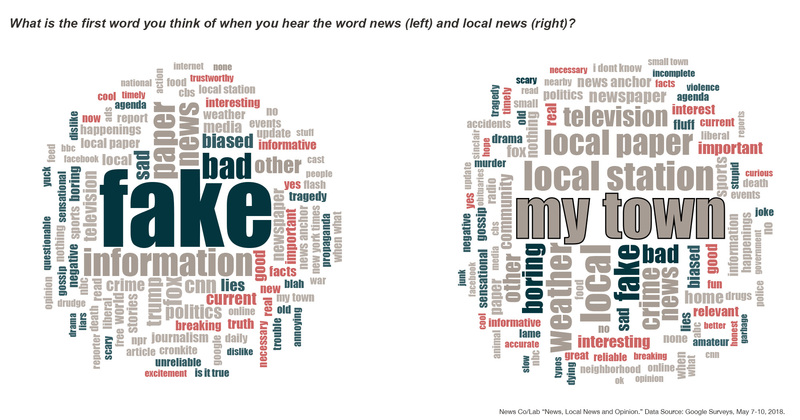 Though three percent of people associate local news with “fake,” it is clear from the results that people have far fewer negative associations to local news than they do to news in general. This finding coincides with recent research from the American Press Institute’s Media Insight Project that found people have a more positive view of their local newspaper and television stations than they do of national counterparts. A 2017 Morning Consult + Politico poll and a Knight Foundation-sponsored study also indicate that people have a higher degree of trust in their local news outlets. We also wanted to learn more about how people judge their own ability to tell the difference between fact and opinion, and if different types of media were more difficult for people than others. Most people said they find it easy to tell the difference between fact and opinion, and there were some minor differences between media types — people judged it a little harder for cable TV news and a little easier for local news. So what does it mean? Are people who have fake news on the brain more inclined to be skeptical of the news they consume because they think it’s likely to be fake? Do negative perceptions of the news lead to greater confusion about what is fact and what is opinion? The survey results can’t give us those answers. But they provide a good national baseline upon which to conduct more research — both quantitative and qualitative in nature — to find out if there is a connection between people’s perception of news and local news and how difficult it is for them to distinguish fact from opinion (among other critical news literacy skills). The public’s waning trust of the news industry didn’t happen overnight; it’s been on the decline for decades. We know that all media are not created equal, but too often people lump all news outlets into the category “the media” and then summarily dismiss it. In working with newsrooms around the country, Trusting News has found that when people think about journalism, they aren’t typically thinking about local news, but rather national media. People’s complaints about the media are often broad and reductive. This also bears out in our survey results. But when we asked people to focus on local news, we saw a different pattern emerge, one that includes the names of local newspapers and television and radio stations, along with neutral coverage areas like weather and traffic. What the results represent to us is the advantage local news organizations have to build — or rebuild — trust in their communities in order to reassert journalism’s importance as a pillar of democracy. A lot of attention is being paid to innovation in local news around the country; the Democracy Fund’s Local News Lab newsletter is filled with inspiring examples, and we’ve profiled several local news initiatives that have seen measurable results for improving transparency and audience engagement in the News Co/Lab’s Best Practices collection. The hurdles, including a deeply troubled business model for local journalism, remain daunting even if there are reasons for optimism. New ones are emerging, meanwhile. Last week, NPR reported that The Internet Research Agency in St. Petersburg used fake Twitter accounts with names reminiscent of local news outlets to spread disinformation during the 2016 U.S. presidential election, indicating that local news is not immune to the fake news epidemic. And the horrific mass shooting at the Capital Gazette newspaper in Annapolis, Md., reminds us just how vulnerable journalists are simply doing their jobs. The “journalists as enemy of the people” narrative being repeated across our Twitter feeds certainly will not help prevent another local newsroom tragedy. In spite of the odds, we are optimistic about local news’ role in reshaping public perception of “the media.” The News Co/Lab aims to help the public find news ways of understanding and engaging with news and information. We do this, in part, through collaborations with local newsrooms that believe that increased transparency into the news-making process and meaningful community engagement will help improve trust and help people become more active and fluent news users. We will continue to test our experiments against this hypothesis with the goal of developing a body of research that has academic and practical applications for local news. 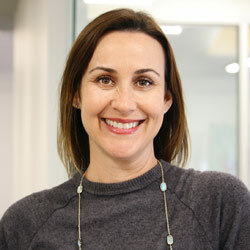 We are grateful to Amy Adams Harding, global head of Google Surveys Publisher Development, for helping us develop our survey questions and for subsidizing survey implementation costs.